Provide comfort for the family of Sebastian Gangemi with a meaningful gesture of sympathy. SEBASTIAN “SONNY” JOHN GANGEMI, 84, of Jackson Twp., NJ, passed away on Friday, January 25, 2019, at The Specialty Hospital of Central Jersey, located at Monmouth Medical Center, St. Barnabas Southern Campus, Lakewood Twp., NJ. He was born in Jersey City, NJ, and resided in Jackson Twp. for over 50 years. Sebastian was employed as Facilities Manager for the school district by the Jackson Twp. Board of Education, retiring in 1990. In addition, he held positions with Jersey Shore Savings and Loan, Toms River, NJ, and Six Flags Great Adventure, Jackson Twp., NJ. Sebastian was predeceased by his parents, Rocco and Angela Gangemi; his sister, Frances Russell; his brother, Bruno Gangemi; and by his nephew, Rocco Gangemi. He is survived by his loving wife of 47 years, Rosalie Gangemi; his daughters, Cheryl Mazzeo and her husband, Ralph of Toms River, NJ, and Sandra Reich of Toms River, NJ; his 2 grandchildren, Nicholas Mazzeo and Christina Mazzeo of Toms River, NJ; his sisters, Carol Meyer and her husband, Bernie of Bayville, NJ, and Rosemary Kidd and her husband, Tommy of Whiting, NJ; and by his nieces and nephews. Relatives and friends are respectfully invited to attend his visitation from 4–8 PM, on Wednesday, January 30, 2019, at the GEORGE S. HASSLER FUNERAL HOME, 980 Bennetts Mills Road, Jackson Township, NJ. A funeral gathering will be offered at 8:30 AM, on Thursday, January 31, 2019 at the funeral home. His funeral liturgy will follow at 9:30 AM, at St. Aloysius Roman Catholic Church, 935 Bennetts Mills Road, Jackson Township, NJ. Entombment will follow in St. Mary of the Lake Cemetery, Mary Queen of Peace Mausoleum, 2351 Massachusetts Ave, Toms River, NJ 08753. For directions, further information and to send condolence messages to the family, please select a tab on the left. Consider providing a gift of comfort for the family of Sebastian Gangemi by sending flowers. We encourage you to share your most beloved memories of Sebastian here, so that the family and other loved ones can always see it. You can upload cherished photographs, or share your favorite stories, and can even comment on those shared by others. Lori and LC Style Lounge sent flowers to the family of Sebastian John "Sonny" Gangemi. 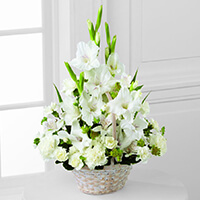 Lori and LC Style Lounge purchased the The FTD Eternal Affection Arrangement for the family of Sebastian Gangemi. The shock of your passing, so soon after your brother, Bruno, left us feeling very sad! You, Bruno and Rosalie were such a support system for all of us in the jackson educatioal family! You were so kind to both of us all during our long careers in Jackson. Rest in peace! Please, not again. My first words as I responded to my Daughter’s words: “Uncle Sonny passed away Mom”. Just 2 weeks after his brother (Bruno) died, it does not seem possible, but, with a very heavy heart, I have to say, it’s true, he too is gone. 2 Uncles who were very close gone in 2 weeks. My Moms 2 younger brothers. The two men that I made an Uncle. Anyone that knows Uncle Sonny knows he was everyone’s Uncle. A man you can call any time of the day, any time of the night, and he fixed it, no matter what, he made it better. He would walk over to my house to see my Mom, it didn’t matter when, “Are you makin’ coffee” he would say, always having a piece of cake too. I can still see him walking up the driveway, the cold, the heat, the rain, sleet or snow didn’t stop him. When I was little and aggravated my Mom, my Dad would be working and my Mom would say “Just wait till your Uncle gets here”....His trips with Aunt Rosalie to AC would always end in Pastrami sandwiches for us which he took pride in bringing home and setting them in our fridge. In the earlier years he and Aunt Rosalie always had Thanksgiving (his Birthday time) and New Years at their house, it was something we all looked forward to...and there he was with his vacuum 2 o’clock in the morning picking up the confetti he let us kids throw. I never a day in my life saw him cry, until the both of us were walking through a hospital vestibule and they were filming an ad for children with cancer and I looked at him and he at me, and we burst into tears. So soft hearted, treated his nieces and nephews as if they were his own children, always said “so long”, kissed you on the forehead and ended it with “Unk loves you...I can truly say, I’m heartbroken. “I love you too Uncle Sonny,” take care of everyone up there with you, until we meet again. Dear Uncle Sonny, You have, along with Uncle Bruno, have blessed me with so many wonderful memories from childhood through adulthood. I was extremely lucky to have you as an Uncle. You were the Patriarch! You made it work! You were the cohesive piece. You loved all of us unconditionally. I will hold dear to my heart the amazing Thanksgivings and New Years Eves. As my children grow, I always remind them where I came from and all the special memories and moments frozen in time in the basement of your home. Thank you Unk. Rest in peace with all those who have passed before you.